A Celebration of Life will be held on Saturday, August 11, 2012 at 2:00 p.m. at First Memorial Boal Chapel, 1505 Lillooet Road, North Vancouver. Eugene Kern was one of the good guys – a generous, gentle, loving man. His intelligence, thoughtfulness, loyalty and curiosity were the foundations for a full and rewarding life. He had the ability to make even routine situations seem interesting. He was a natural leader and an excellent educator. Gene always sought out the scene of where the action was. Sociable, analytical and pleasant, Gene was an individual who enjoyed life’s challenges. Gene was born on July 31, 1926 at Galt Hospital in Lethbridge, Alberta. His parents were Clifford and Mayme Kern, a train station agent and a school teacher. Gene was raised in Lethbridge and Glenwood, Alberta. Always able to express himself well, Gene possessed strong interpersonal skills. He was optimistic in his outlook on life and was able at all times to be open and direct in his communication. Armed with a great wit, Gene was raised to be responsible and to implement a strong personal work ethic. Blessed with a balanced attitude, Gene was able to relate well with others. His occasional role as family mediator gave him the opportunity to ease tense situations when they occurred. Gene was raised with five siblings. He had one older sister, Aileen, two younger brothers, Sydney and Harvey, and two younger sisters, Florence and Terry. Sadly, Aileen and Harvey are no longer with us. Gene had a strong desire to be treated fairly and would readily offer others the same fairness in return. He took his role as big brother very seriously but still managed to participate in his share of brotherly mischief. As a young child, raised in the depression era, Gene learned to live by his father’s motto, “waste not, want not”. He showed his creative ability in many ways. He was thoughtful and innovative. Gene was very proud of having a paper route at an extremely early age. His entrepreneurial skills were ignited with this first paying job and he soon expanded his route and hired his two younger brothers as employees. Of course he made a profit on the fruits of their labour. Gene enjoyed new activities and pursued a variety of interests. He took part in hockey, basketball and baseball. He loved music, playing the alto saxophone and amateur or “ham” radios. He was a member of a band in high school and travelled all over southern Alberta playing at various dances and events. His favorite class in high school was physics. Known to others as a focused, logical, open-minded and somewhat dependable individual, Gene was able to utilize these qualities to enter university at an early age. His curious nature was spurred by his ability to maximize his personal learning style through employing a hands-on approach. He was good with facts and had an excellent memory. Gene attended the University of Alberta in Edmonton when only 16 years old. He was able to absorb complex concepts and had an acute sense of how things worked. He earned his teaching certificate from the University of Alberta. His favorite courses were psychology and teaching pedagogy. While at university he commenced his first professional broadcasting job – a track and field report for CKUA Edmonton. In 1943 Gene was sent to teach in a one room school house in Leduc, Alberta. Gene was only 17 years old, but rose to the challenge of educating 40+ students in 7 or 8 different grades, at the same time. His annual salary included room and board where he was billeted at one of his student’s homes. He was promoted to a less rural one room school in Lethbridge, Alberta for the following year. With the conclusion of World War II, he was no longer needed in the classroom and returned to complete his own university education. In 1947 and 1948, Gene briefly relocated to Vancouver and worked in the News Department at CKMO. From there he went to Fort Francis, Ontario for a year and a half as an announcer at CKFI. Gene was hired to work at CFPA in Port Arthur, Ontario (now known as Thunderbay) in 1949. In between jobs he took a three week hiatus and went down to check out the broadcast industry in Toronto. An old friend at CFRB gave him a summer relief position news casting where he competed against the noon time Alka-Seltzer news at CKEY read by Lorne Green and written by Roy Jacques. Gene met and ultimately married Kaye in Port Arthur in 1951. Together they moved to Vancouver and joined the bulk of Gene’s family as West Coast residents. In Vancouver, Gene first worked as an announcer/sales person at CKMO during 1951 and 1952. 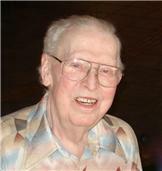 Before the birth of his first child in 1952, Gene started work with CKWX as an announcer. CKWX had just acquired a new studio and control room equipment. The station was now on air 20 hours a day, from 5:00 a.m. to 1:00 a.m. Gene found a true home at CKWX and eventually retired from his position as Production Manager in 1991 at the age of 65 years. Gene was a flexible worker who was able to draw the best from others around him. A persuasive individual who was quick to make necessary decisions, Gene’s strengths included being able to think on his feet. He could be a leader who sought impact for his decisions. Perhaps his most notable skill was his wonderful, baritone voice, heard for many years over the airways across the country. He was a gifted teacher and mentor for young broadcasters. Helping to mentor new talent was one of his passions. Gene was one of the founders of the Columbia School of Broadcasting in BC and in his spare time, taught Columbia students for many years. He often served as a guest teacher and speaker at many of the post-secondary educational facilities in Vancouver, including BCIT, SFU and UBC. Gene was able to positively motivate others in order to get a task completed. He was a good negotiator who enjoyed new challenges. Gene could multi-task, and he was endowed with entrepreneurial spirit, allowing him to think beyond standard norms when it came to resolving issues in his work environment. Similar to many broadcasters, Gene did a lot of freelance work. He produced a phenomenal amount of commercial work. During his peak, you couldn’t go a full day without hearing his distinctive voice on several different commercials throughout the city and even throughout the nation. His entrepreneurial activities also included: part ownership in a gold mine (he loved to pan for gold! ); motivational courses and audio tapes; Robert Service productions; Columbia School of Broadcasting; and mortgage funder. Gene was an instructor for army cadets from 1940 – 1942. Gene was a cool thinker who could handle himself well in a crisis. In 1940 – 1942 he taught army cadets in Diamond Alberta as a high schoolteacher with the equivalent rank of Captain. He showed leadership qualities and could make tough decisions when he was called upon to do so. Gene was something of a sports fan and enjoyed watching his favorite events whenever he got the opportunity. To increase these opportunities he worked at baseball and BC Lions games as an announcer, on weekends and evenings, for many, many years. Watching golf on TV was also tops on his list. Gene was a gifted problem solver who worked hard to help accomplish group goals. This skill made him a wonderful asset to the various groups and organizations to which he volunteered. Always matter-of-fact about what needed to be done, Gene worked steadily to meet any organization’s goals. His decades of volunteer work included producing music for many budding athletes, figure skaters in particular; recording church and school choirs; producing public service announcements especially for the CNIB; he was one of the original founders of the Carol Ships Parade of Lights and was involved in many other worthy charities. Gene’s natural leadership qualities and dedicated volunteerism placed him in consideration for public recognition, earning him accolades for his many and varied efforts throughout his life. Some of his most prestigious awards included a CLIO Award for a series of Egg Marketing Board commercials and the CNIB 1985 “Voice of the Blind” award. Gene and Kaye were blessed with four children, two daughters, Lynn and Donna, and two sons, Jeff and Steve. They were also blessed with eleven grandchildren; Laura, Allison, Brian, Heather, Ashley, Adrienne, Kelly, Lisa, Kathy, Thomas, and Matthew. Gene was especially thrilled with the arrival of his first (and only so far) great-grandson Aiden. Kaye and Gene enjoyed 59 years of marriage together, until Kaye passed away on August 1st, 2010 after a long illness. Travel and vacations were experiences that Gene truly enjoyed. He was partial to vacations that were casual and laid back with an atmosphere of “live and let live.” He was willing to leave his plans open and flexible, just in case something more interesting came along. Favorite vacations included family camping trips throughout BC and Alberta; Antigua; Hawaii and bus trips to Reno with wild and crazy friends. Gene was a lover of animals and cherished his pets. One of Gene’s favorites was Buffy the grand-cat. Gene and Kaye always had a dog and one or two cats as family members. When Gene’s retirement finally came in 1991, he was well prepared. He enjoyed just having fun and being relaxed. In retirement, he found new pleasure in travelling with his wife, freelance recording, puttering around his house and yard, attending RPM luncheons, communicating through e-mail and expanding his computer skills. Gene passed away on July 30, 2012 at Lions Gate Hospital in North Vancouver. Gene succumbed to pneumonia. He is survived by his children, Lynn, Jeff (Keree), Donna (Peter) and Steve (Marina); his grandchildren Laura, Allison, Brian, Heather, Ashley (Nelson), Adrienne, Kelly, Lisa, Kathy, Thomas and Matthew; his great grandson, Aiden; his brother Syd and his sisters Florence and Terry. Gene was the kind of person who could win others over easily. A concrete communicator, he relied on his senses to increase his involvement and awareness of others. He was always able to provide amusing repartee to his friends and acquaintances, offering a seemingly endless supply of quips, anecdotes, jokes and stories. He enjoyed his life and the experience of living it. Gene Kern will be remembered the same way he lived his life – as one of the good guys.